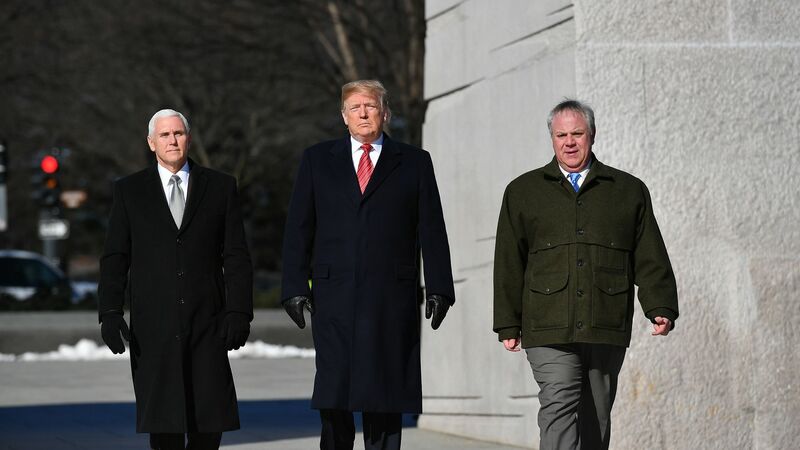 President Trump announced his plan to formally nominate David Bernhardt for the Secretary of the Interior post on Friday, a promotion from his role as acting secretary and deputy secretary of the interior following Ryan Zinke's departure in late 2018. Details: Bernhardt's elevation from the No. 2 position was anticipated, after serving in the department for nearly a decade. Bernhardt also worked as U.S. Commissioner for the International Boundary Commission between the United States and Canada. Reality check: According to the Washington Post, during his tenure in with the Interior Department Bernhardt "helped federal authorities approve drilling projects on land and offshore ... proposed narrowing habitat protections for endangered species, and is pushing California to divert more of its water from conservation to agricultural interests," all followed by years working as a lobbyist.